This is verified to be the Griffith Factory Prototype and is serial numbered 200-4-000. Just in from a private collection for the last 35 years during which it was never offered for sale. In 1964 192 Series 200 Griffiths were built; Only 140 of which are still known to exist. Bright Red with Tan Leather Interior. 289 Hi-Po with Dual 4 Barrel Carburetors and Ford 4 Speed Transmission. Featured in the book "The Griffith Years" which documents some of its original build. Autographed by Jack Griffith and Carroll Shelby. 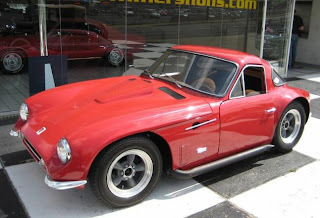 The Griffith was another 1960s attempt at dropping a big American V8 into a small European sports car. The fiberglass bodies were shipped from Great Britain to Long Island, where the Ford engines and transmissions were installed. In 1965, a strike by US east coast dock workers prevented the TVR bodies from reaching the US. For all intents and purposes that strike killed the Griffith. By most accounts the Griffith was not a pleasant car to drive. It was cramped, hot, and ill handling. However, it was FAST. Some road tests showed the car hitting 60 MPH in 4 seconds or less. It had some racing success. It would have been interesting to see what Jack Griffith did with this car had the strike not prevented the bodies from reaching the US. During its short run some improvements were made to the car (most notably the cooling system). With some more improvements, especially to the handling and build quality, the Griffith could have become a world class supercar. TVR capitalized on the Griffith name in later years, building the TVR Ggiffith 500 from 1991 - 2002. A modern, well thought out car, it was, sadly, never sent to the US. You can find some info on it here. The car on eBay has under 10K miles on it. It has been in a private collection for the past 35 years. As you would expect, the car appears to be flawless.